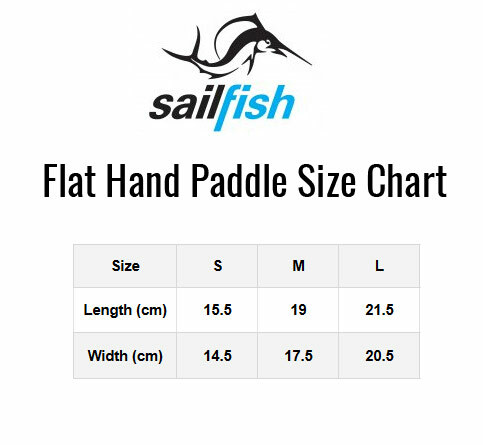 Add these Sailfish Classic Flat Hand Paddles to your swim bag and use them during training sessions to improve your stroke technique while increasing your upper body strength. Silicone straps help these paddles fit comfortably and securely to the hand, and they are available in three different sizes to add various levels of resistance to your training drills. These Sailfish classic Flat Hand Paddles are an excellent training aid for all swimmers looking to develop their stroke technique while increasing upper body strength. Whether you're an open water or a pool swimmer, you're sure to feel the benefits when you start wearing these paddles during your training drills. Featuring soft silicone straps that fit comfortably to your middle finger and wrist, these flat paddles will improve your muscular endurance and stroke technique while providing the ultimate propulsion in the water. Three sizes are available. These do not relate to hand size, but the level of resistance you're looking for. Beginners may want to choose the smaller hand paddles that are only slightly bigger than your hand. They will help you perfect your technique. Larger hand paddles will offer a lot more resistance, so you'll have to work a lot harder to complete each stroke. These are ideal for power-based training.